*There are affiliate links used in this post. Always, Al may receive compensation for clicking the links or making purchases. I'm not sure if it is just me, but whenever the holidays roll around, I get the itch to clean out my products. I think it might be because I often get new products for my birthday and Christmas, so I want to make room for the new stuff. So I went on a bit of a clean out binge last month. I am throwing out some things (especially ones that are expired. Ew) as well as giving some things to my mom and sister. There are often products that don't work for me necessarily, but they end up loving. Since I had so many products this time around, I decided to split them up into a "hair products" list and a "make up" list. Nexus Hydra Light Shampoo - I loved this shampoo when I first started using it. It made my hair silky and soft, and it smells amazing. However, I started to have an allergic reaction around my hairline while I was using this product, so I had to discontinue it. *I received this product for review from Influenster. Nexxus Hydra Light Weightless Moisture Conditioner - This conditioner works really well with the shampoo. It is nice and thick, which I love in a conditioner because it seems like it is actually staying in my hair for a minute before I rinse it out. I stopped using this product when I stopped using the shampoo. *I received this product for review from Influenster. Nexxus Hydra Light Leave In Conditioning Foam - IThis conditioning foam can be used in two different ways—on wet or dry hair. It was perfect for after my hair was dry, and I almost always have some static or flyaways. I stopped using this product when I stopped using the shampoo, and I am really sad about it. *I received this product for review from Influenster. L'Oreal Smooth Intense Ultimate Straight Boosting Pre-Conditioner - I tested and reviewed the whole line of these Ultimate Straight hair products, and this is one that I found that I just really don’t need. Using a “pre-conditioner” is kind of weird, and I found that it weighed my already straight hair down. Batiste Hint of Color Dry Shampoo | Dark & Deep Brown - This is my holy grail dry shampoo. I usually use 3 bottles in the span of two months. One of the biggest reasons why I love this specific dry shampoo so much is because it is tinted brown, so I never have white residue in my hair. Also, it is a drugstore product, so it is very affordable. If you are looking for some other awesome dry shampoos, check out this article! Maple Holistics Hydrate Moisture Control Shampoo – I had never tried a natural shampoo before this, and to be honest I was a little bit leery. However, after 2-3 washes, when my scalp got used to it, I had such shiny hair. I love that this product contains amino acids and keratin because those seem to do wonders for hair. The only thing I disliked about this product is that it had a very earthy smell. The smell wasn’t lasting though, so it ended up being okay. *I received this product for review from Maple Holistics. Maple Holistics Silk 18 Natural Conditioner - This conditioner is great for achieving smooth, silky hair. It contains oils such as argan and jojoba, as well as shea butter, aloe vera and green tea. This conditioner has a pleasant smell for a natural product, and I really enjoyed using it. Rimmel London ScandalEyes Waterproof Kohl Eyeliner | Black – I am such a sucker for black eyeliner. I love to put it both on my eyelid and in my waterline. This product was very soft, and glided right over the eye, which is always great. However I am not a huge fan of eyeliner pencils (too much sharpening), and prefer the ones that you twist to get more product out. *I received this product for review from Influenster. e.l.f. Jumbo Eyeshadow Stick | Rock Out – I picked this up from Target on a whim because I loved the color and it was so cheap. I love the color on me, and think it is a perfect metallic shade for my skin tone. However, if you aren’t used to wearing cream eye shadows (and I’m not), it does feel very weird on your eyes. Rimmel London ScandalEyes Rockin' Curves Mascara | 003 Extreme Black –If there is a makeup item that I won’t leave the house without, it is most certainly mascara. 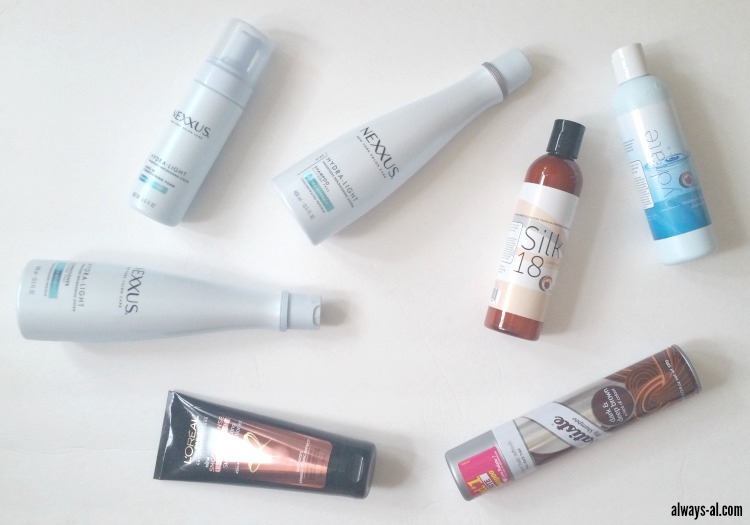 I love to try new formulas and different brands. This mascara gave me a great curl and lift to my eyelashes, and I got lots of compliments about how long they seemed. *I received this product for review from Influenster. Make Up For Ever Smoky Extravagant Mascara – This came in my birthday gift from Sephora last year. I used this up pretty fast, and it was just sitting in my makeup bag. This is probably one of the best mascaras I’ve ever used, and I would highly recommend it. If I didn’t go through mascara so fast, I would totally keep this in my collection. L'Oreal Voluminous False Fiber Lashes | Black Brown – I bought this product after I was finished with my Younique Fiber Lashes. I thought that there was a possibility for this to be a dupe, but it totally isn’t. Also, I accidentally got the color Black Brown, which is way too light for my eyes and skin tone. Maybelline Volum'Express The Rocket Mascara | Blackest Black – I loved this mascara so much that I bought another tube of it. I love the rubber brush head, and think that it does such a great job of volumizing and lengthening my lashes. I would highly recommend this product. NYX Cosmetics Micro Brow Pencil | Taupe – A micro brow pencil like this one is what I prefer to do my eyebrows with. There are some parts of my brows that need a little more filling in than others, and I find that the brow pencil/spoolie brush combo does a great job. This was a great color for me, and I used it up really fast. Chella Eyebrow Color Pencil | Tantalizing Taupe – This was another micro brow pencil that I tried, and I loved it. The product itself is very smooth, and when applied, it really looks like brow hair. I only wish that this product had a spoolie attached, to make filling in your brows easier. Rimmel London Moisture Renew Lip Liner | Transparent – I have to be honest… I am not a huge lipstick wearer, and am really just now trying to wear more of it. This product is creamy on the lips, and seems to do a good job of keeping lipstick put. It is a little bit hard to know where you’ve applied it, because it is transparent, but it is awesome that you can use it with any shade of lipstick. *I received this product for review from Influenster. NYC Expert Last Lip Color | Sugar Plum – This is a nice, pretty color for the winter time. It was very smooth and lasted a while on the lips. I was honestly surprised at the quality of this lipstick, and the fact that you can get NYC brand cosmetics at drugstores for so cheap. It does have a slight pearlescence to it, so if that is not your thing, I don’t recommend this. *I received this product for review from Influenster. Josie Maran Argan Infinity Lip And Cheek Creamy Oil | Limitless Pink – I received this product as part of a Christmas gift last year, and I immediately fell in love with the Josie Maran brand. I am always a little weary of lip and cheek products, because I am not a fan of cream blushes. Even though this is infused with argan oil, it does not feel oily at all on the skin, and the color is a great lip color for spring. Revlon Photo Ready Insta-Fix Concealer | 120 Vanilla (similar) – I was using this product at a time when I was having very bad acne. This is a stick that you can apply by itself or with a brush. It is pretty heavy and creamy, and does a great job of covering up blemishes. If you have very oily skin, I suggest using a mattifying primer before using this product. CoverGirl Clean Pressed Powder | Buff Beige – This used to be my go-to pick for pressed powder. This powder helps with oil control, and does not feel thick on the skin. Before I found the Rimmel Mattifying powder, I would exclusively use the CoverGirl Clean powder. 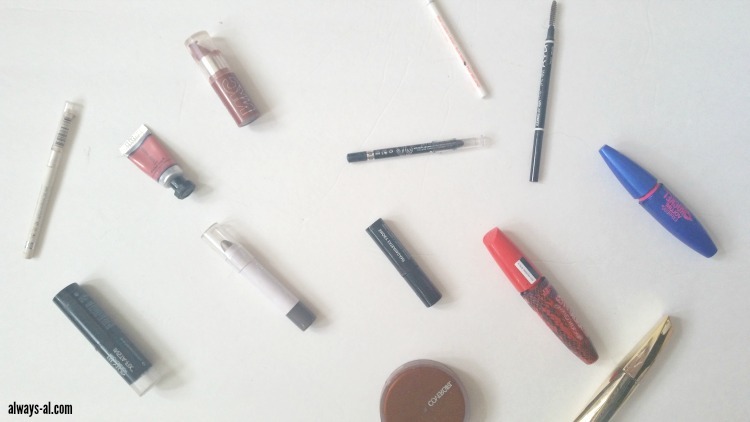 I also love that it comes in a compact, and you can throw it in your purse for use on the go.